for World Adventures and Ambitions and Late Night. This is a big multi-part download. READ THE INSTRUCTIONS ON THE INSTALLATION PAGE CAREFULLY. This is a big multi-part download. IF YOU DO NOT READ THE INSTRUCTIONS ON THE INSTALLATION PAGE CAREFULLY LITTLE CREATURES WILL COME IN THE NIGHT AND EAT YOUR HAIR OFF! AND YOU'LL GROW HAIRY PALMS AND YOU'LL GO BLIND *INSANE*! SO DIG OUT YOUR READING GLASSES AND HAVE A PEEK. PLEASE. 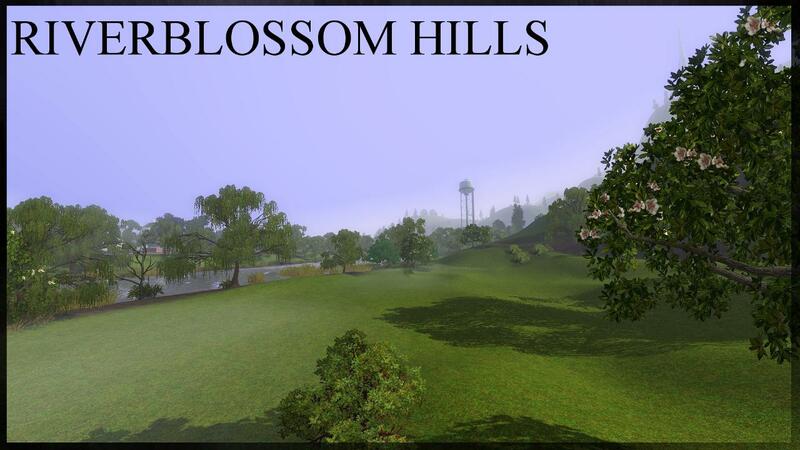 Riverblossom Hills is prepopulated. The world will install with its sims, fresh from the Simpack. Caution: The prepopulation method has resulted in no issues for testers so far. If you do come across an issue and suspect prepopulation may be the cause, please alert us in the comments. However, the method has had a lot of testing at this point and seems perfectly safe. 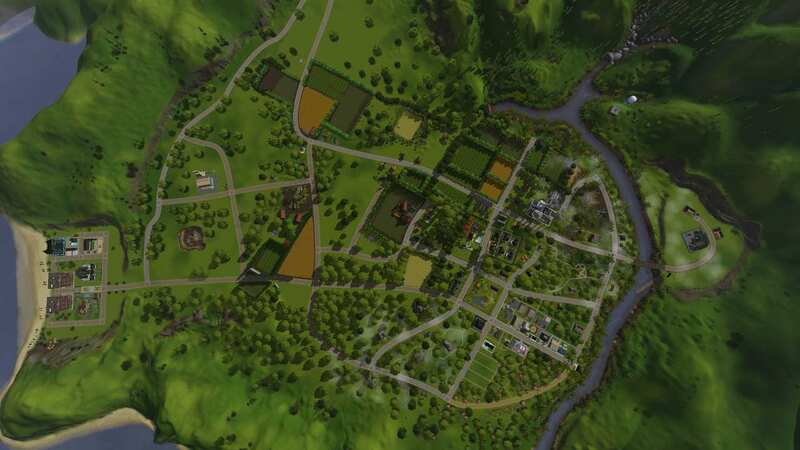 Based on the neighbourhood from The Sims 2: Seasons. World file pre-populated with premade sims, including familiar faces. Many Sims have relocated to the quiet, comfortable countryside, in the hopes that life and family can firmly plant their roots in the middle of nowhere. Fresh crops aren’t the only thing growing in the farming community of Riverblossom Hills – love is in the air and many a relationship is on the verge of blossoming. Spawners: All the spawners up to and including Late Night are available except for regional dig sites. Some generic and fragment dig sites are available. Routing/Layers: Sims can route almost everywhere except steep terrain. The camera routes to the very edge of the valley, giving good panoramic views. At extreme distances the (two) distant terrains can start to clip out of sight, but this doesn't happen during most gameplay. The world file is divided into 6 layers. There are 13 textures in the world, but only a max of 8 textures per chunk. All necessary rabbitholes and community lots are included up to Late Night, excluding the Poolside and Dance Clubs. There are 10 representative lots listed in the comments section. See the first comment for a list of lots. Custom service NPCs are included, as well as a wide range of custom homeless Sims who will become bouncers, etc. For this reason I don't recommend deleting homeless Sims when using alternative Story Progression mods such as Awesome mod or NRaas Story Progression. There are 8 representative Sims listed in the comments section. See the first comment for a list of playable households. If you are opposed to Occult Sims you might want to seek out and delete the 10 premade vampires and 2 premade Simbots using Twallan's Master Controller or a similar mod. The Sims 3: World Adventures, Ambitions, Late Night. 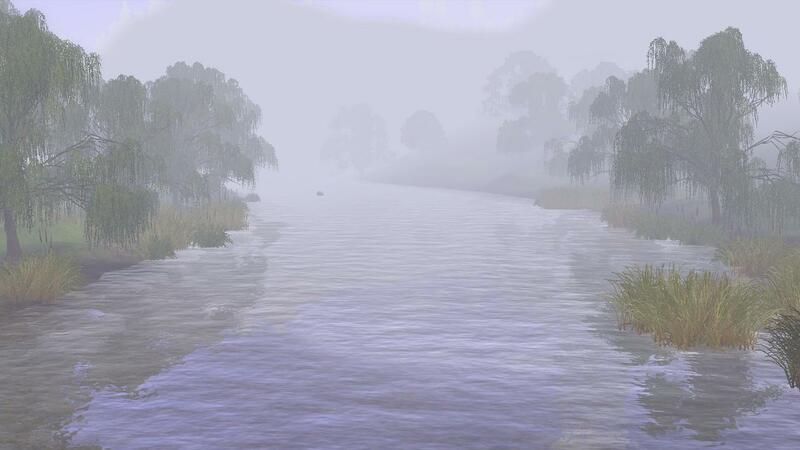 Riverview from The Sims 3 Store. (Optional) The Sims 3: High End Lot Stuff, Fast Lane. None of this needs to be downloaded. I'm just pointing those interested to important assets used in the world. Many thanks to the simmers who provided these! Numerous textures by Martine found here. Numerous textures by BSIRegina found here. Twallan's collection of NRaas mods. Thanks: dolldrms1 (so much! ), twallan, J.M. Pescado, auntielynds, Writing_Reg, Rflong7, DarkMirage, moryrie, Robodl95, Judhudson, bellatrixclovis, Miuki, Kaospilot, Sandranym, Deluxe Designs, SimGod21, cutsocks, Gamineannie, simsample, BSIRegina, Martine, GiLaNg, Nekocat, sleepyrose, candlelight82, MCO798, sleepalldaypartyallnight, girlyb, Amberzip, have2admit, MadGaz, mariomaniac86, Rukaya, everyone at ModtheSims.info. 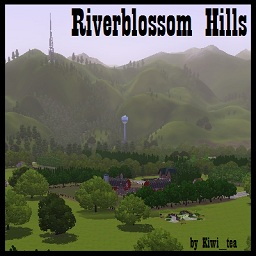 - Download the eight individual rar files entitled RiverblossomHillsLN.partXX.rar to the same folder. You may need to remove the MTS-generated numbers from the start of each file for this to work. Use the filename above as a reference for what the files should look like prior to unzipping. - Using a program such as WinRAR, extract the file RiverblossomHillsLN.part01.rar. This will also extract the other related rar files and leave you with one working Simspack. - Before extracting, remove the random numbers at the start of the file names. These are generated by MTS. You will need a programme like WinRAR to extract. - Extract the files by putting them in the same folder and clicking the first part. - Double click on the resulting simspack. The Sims3 launcher will install the world for you.